Pinksummer: Dramatic and frightening is the image you have chosen for the invitation card of your exhibition at pinksummer. The same angel on the Ribaudo family’s tomb at the cemetery of Staglieno, that was chosen by the Joy Division for the cover design of their single” Love we will tear us apart”. 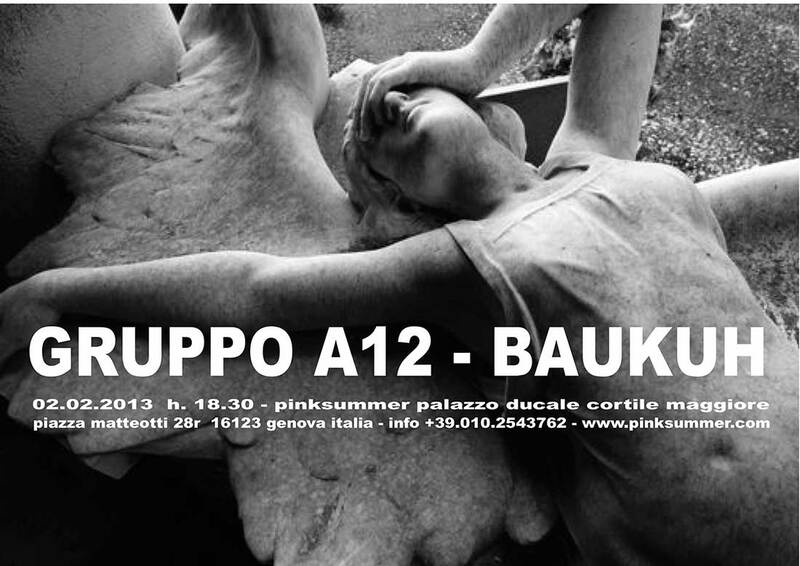 Let’s start from what Baukuh and Gruppo A12 have in common: Genoa and Stefano Boeri first, not to mention architecture itself. Did the common imprinting from the city, its genius loci, only taught you how to get away as fast as you can? What about Boeri’s social (political?) approach? Baukuh: Beyond the – obvious – association with the “terminal” condition of Genoa, city of older people and most of all of no interest for whichever future, we chose the angel of Joy Division a little by chance. In a sense, it is also significant that this image of Genoa was produced outside the city, which is by now our condition. Moreover in our case, we (five on six) are not even from Genoa. At a certain point we have chosen to work there, then we have preferred to move the studio and now we would like (at least partially) to reopen our studio in Genoa. It is maybe because we are architects, we do have a very little sentimental relationship with the city. Cities can be used for some time, then you may change idea, then maybe you changes idea once again. About Genoa’s genius loci, speaking from our position of people who come from outside, we do not dislike it. Sure, it is clearly suicidal, but it has its own greatness. As far as Stefano Boeri, that was an Hobson choice, as there were not a lot of other options. I do not know if you have an idea of the situation of the architecture in Italy at the end of the Nineties. Therefore even those, whose interests were rather distant from Stefano’s, ended up to work with him almost unavoidably. Also Stefano is an extremely intelligent and generous person, able to gather together very diverse people. And he has the virtue of not considering itself a loser, which, while working with him, gave you the impression – completely exceptional in that context – that it could even happen that you may not be a loser, you either. Gruppo A12 : We are two groups of architects, we share the same dimension of collective work too, even though carried out with different modalities and stories, and probably we are different even in our relationship with the city and Stefano Boeri. Joy Division’s song it is about a tormented love and Genoa is not an easy city. Learning to see it a little like the eyes of someone from outside do is a useful exercise that would be healthy for all Genoese people. Concering Stefano, we have met him in the beginning of the Nineties, when we were a little more than twenty years old. A little older than thirty five, he was at his first teaching assignment as associate professor. For sure that was a breath of fresh air in a rather creacky academic system, with the ability of involving you and let you feel you at par as a plus one. A12 was being born just in that period and from there a series of collaborations is been born, even though they did not continued then therefore over a long time span. P: Somewhere we read that after the end of the classicism and the sunset of modernism, for architecture we are in the time of post-critic, of post-theory, probably just post and that’s all (also for visual arts we are in the imperative hit-and-run of the curator, somehow close to the sell-earn-and-regret of the finance, agnostic or boor as it might be). In that sense, architecture is meant to be a trade sunk into the mere pragmatism and, in the same sense, the exhibition at pinksummer could always be considered an aporia, an impossibility, an absurdity, or just a loss of time? G.A12: Actually in architecture, in front of the economic crisis that has hit in the heaviest way the real estate industry and in front of the discipline that has been lain down on the stylistic marks of some professionals of fame, we see an uprising interest for drawing, speculative projects (in terms of theory of knowledge, not real estate speculation) and for all what can pretty much represent the purest research to architecture. One can say that the majority of our activity as a groop has been based on that kind of research, even though, because of our much more pragmatic than theoretical attitude, everything has been ending up in temporary installation instead of texts, diagrams or big that has been translate in ephemeral installations instead that witnesses, diagrams or large drawing plates. Regarding the abuse of “post”, that is probably due to a defect of the critics, that is not capable to define anything if not in connection with what it happened before. B: To be honest, there is very little pragmatism/profiteering at the moment. As real estate market seems to be dead and never resurrect (and probably it will not resurrect, at least as we have been knowing it so far), within a 35% juvenile unemployment scenario, it seems difficult to imagine that one can be so busy in making good money that he is not able to have an exhibition. For what concerns all that list of post-something that you have mentioned, we believe that it is a perspective, which does not help very much. Perhaps it is just the fundamental assumption of the whole modernism and postmodernism that should be discussed. We cannot think in terms of an univocal historical development, to which we just should clutch, as if the Zeitgeist was riding a motorcycle and were attached like a sidecar. I would say that Latour has made clear enough that this type of modernity is just superstition. P: A silly question for baukuh. Concerning your Two Essays On Architecture (Due saggi sull’architettura, Genova, Sagep editori, 2012), we have been thinking at a much arbitrary comparison to the movie “Amadeus” by Milos Forman. Giorgio Grassi is Salieri, poor thing, and Aldo Rossi is the Mozart of the history of architecture, poor thing? Therefore the answer is that Grassi is Salieri and also Rossi is Salieri, but above all also Mozart is Salieri, even because otherwise it would be just a jerk. P: A question for Gruppo A12. Something on your participations to the Kröller-Müller Museum and to the Venice Biennale of 2003: does it persist any substantial difference between architectonic “system” or even “architectonic device” (these being the definitions of your work, that we heard on those occasions) and actual architecture? And in case that difference exists, is it just a matter of temporality or even of responsibility? G.A12: Those terms have a specific meaning and they have been used to describe our interventions probably because our answer to a particular typology of architecture (the temporary exhibition pavillon) was much wider than a mere solution of the architectonic theme in terms of form and function and opened a reflection on nature of collective space and the urban condition. Both of those participations can be considered some sort of manifesto for a rather precise idea of architecture, generally valid. Their ephemeral nature, on which many people focused, has been completely accidental to us and is related to the fact that, for several reasons, contemporary art exhibition are almost the only context, where we manage to express such ideas. P: Do you have any relationship with vernacular architecture? G.A12: For some reasons, it is impossible not to have it (believe it or not, even the “cultivated” architecture or “auteur architecture” origins from there). We cannot say that we have a specific interest for the topic or a particular “taste” for vernacular aesthetics, traditional construction techniques or spontaneous architecture, even if the appearance of some our jobs could recall self-made constructions, which is one of the possible interpretations of the term that you used. Our approach to the construction of the project, also in about its formal aspects, is much more conceptual. If “vernacular” refers to the achievement of some minority to sympathize with, of some poor thing to whom you give something to charity to set your mind at rest, then it is ethically disgusting. We do not believe at all to the “architecture without architects”, that it is always and solely architecture made by “architects” (because such are they, even if they do not have the stamp of the order) overwhelmed, forgotten, exploited. If this “architecture without architects” has reached some formal achievement – as most of the time did – it was always just because there the awareness of a project and therefore an architect was there, even though his track got lost. If instead by “vernacular” you mean simply a picturesque appeal, where everything is a little blurred, a little adjusted, a little more gentle, a little more innocuous, that is just crap. P:Rem Koolhaas the Superdutch is going to be the curator next Venice Biennale of architecture. What do you think about it? G.A12: That follows last year trend of entrusting the direction of the Biennale to important international architects rather than architecture critics or theorists. Of course, Koolhaas is an architect whose activity is equally shared between research and building practice, one of the most influential personalities who have radically changed the way of making architecture during last 30 years. Therefore we are curious to see how he will carry out that assignment. Koolhaas will be an excellent curator. I would say that he has the right to do whatever he likes to and we trust him. Overall, we trust in Koolhaas, Gerhard Richter, Derek Walcott and Steve Albini. They all can do whatever they want. P: Cities get ill and sometimes they die too. Sometimes that happens for natural causes, like the sanding up of harbors, other times is an infected politics that slow them down to death. Genoa is dying a little bit, it is not basted by good connections, it is bleed white by the consistent emigration. Genoa is more and more beautiful though. Could the Architecture, the true one, the one of the city and for the city, not the overbearing and the individualist one of archistars, be a medicine? Isn’t it a dog chasing its own tail? Can the architecture of the city, of the community, prescind from a healthy politics? G.A12: No, architecture cannot be a medicine for the society. Aldo Rossi, between a symphony and a quartet, on the relationships between politics and cities, says that ” the city actualize itself through its own idea of city”. City, architecture, artwork are products of the society that they express. The quality of the architecture depends at least equally on both the patronage and the architects. Therefore, a good public architecture is possible only when the public patronage (politics) is aware of the importance of the quality of the space where citizens live, it is convinced of the necessity of a consistent planning to obtain it and it is determined to face all the difficulties of making that happen. But there is no link between quality of the architecture and “health” of politics, as we mean it today. If we look back at the past, we realize that often also corrupted regimes and ferocious tyrant have produced wonderful architectures. B: For Genoa’s specific disease, architecture cannot be a medicine. Only politics could it be. P: Regarding the reflection that you are going to elaborate in form of exhibition at our gallery, you move from different approaches leading to different outcomes. baukuh refer to a pragmatism, that we like to improperly define “butterfly effect”. You act very little, but you are everything but modest. A barely perceivable quiver of a wing provokes a cyclone (even though contained and tendentially quantifiable in terms of power) of effects that improve space and, consequently, life in that space. You have a solution and the solution grows and develops inside the belly of the architect. Keeping on with this unexpectedly astrological style, good for the year just begun, we would say that Gruppo A12 has grown bigger on genuine food and, most of all, on radical architecture. Your language claims the ethical linearity of modernism, utopia is your beacon, but the cynical quadrature of postmodernism was not in vain, therefore the light you follow, still shining, incorruptible and enchanted, tends to shine on a wrong way round world, where progress clashes with the positive and positivistic myth of eternal youth. You let it crash louder, by simply amplifying the noise of the crash. You tend not to get out the speculative dimension. Sometimes architecture seems like a pretext, but then one notices that it is the condition, the foundation stone. You do not have solutions, but we suspect that, even if you had some in your pocket, it would look like ingenuous to you offering it, because that could be nothing but partial, compared to the problems you pose or, better, that history poses and that you round-off upwords. 12/11/1972, the beautiful exhibition that you presented at pinksummer in the 2002, developed from the present to the past and vice versa, in order to show and to demonstrate how a city can be read as a sort of diary, written with the rather objective alphabet of architecture, where all the changes of the society are consciously or not recorded. Focault entered into the language and he inhabited it as one could inhabit a city of bricks and mortar in spite of the systematic rules by George Grassi, analyzed and interpreted by baukuh in their essay Due saggi sull’architettura. In your new project you start from the present and you deduce the future (we would rather use the verb to evoke). Anyway, seeing butterflies in Genoa is as improbable as coming across Tredicino that runs after the seven-league boot. B: We present something very easy: a project called “Demolishing Genoa” that proposes the demolition of 1% of the built-up area of a city, that has lost a quarter of its population in the last twenty-five years and that, at the same time, is in a disastrous hydrogeological situation. The work is part of a broader research, titled “Genova meno uno percento” (www.genovamenounopercento.it) that involves other Genoese architecture workshops (Gosplan, OBR, Sp10, Una2) to point out a problem and a possible opportunity, that the city risks to ignore. The project is described through two large drawings that represent the current situation and proposed transformations by using as sample the Bisagno valley. In spite of the intentionally terrifying title, “Demolishing Genoa” suggests a program of very tiny demolitions, small, very cautious “surgical” interventions. This cautious strategy would concur to increase the amount of poriferous grounds, greens areas and public spaces available to the city. The intervention we present are purposely not very showy; the difference between the current situation and the proposed scenario visualized by the two drawings is almost imperceptible. Nevertheless we think that such minor transformations could reactivate some parts of the city and hence promote wider transformations. In the end, we do not get tired of repeating it: we are realist. If there is something we are not interested in, that is utopia. It is always possible to make happen what we propose, even though perhaps to do that a small change of perspective is needed. G.A12: Let’s get back to Genoa and focus a general phenomenon that here is particularly sensible: the progressive aging of the population in western society. That is a trend that is going to reach a critical point and we are interested in the possible consequences on the organization of the cities and their spaces. If we look back to the past, in front of such kind changes only avant-garde movements and utopistic thinking have been able to provide enough large-scale visions. However, in their leap towards the future, all the utopic or radical visions have been always based on an healthy man, full of energies and potentiality, mature and effectively productive, endowed with reproductive abilities. What happens instead, if we try to put in the center of our utopia a typical old man? A man, or a woman, older than 65 years, who needs to face a condition of weakness if not illness? And most of all, what does it mean to design a city devoted and purposely built for that kind of people? What we are going to display in our exhibition is a collection of notes for planning a new urbanistic utopia, entirely dedicated to old people. P: A question for A12, inspired by a very recent article appeared today on Sunday issue of the newspaper Il Sole 24 Ore. The project you are going to present at pinksummer moves from statistics and mathematical probability to read a not-so-bright future. In his article, Carlo Rovelli affirms that “probability is the careful and rational management of our ignorance” and that “the theorem of Bayes supplies a formula for calculating the probability for an event to occur, when I end up knowing something more about it”. Concerning Genoa inhabitants inclination to get older and older, did you by chance find, at least on local scale, any possible alternative to decay, different from seaquake, scarcity, war or epidemy? G.A12: After quickly surveying on the Internet, we have learnt that the theorem of Bayes find its application in anti-Spam filters and e-mail programs, which means that it is thanks to that theorem that we lose messages of vital importance, without any success in avoiding daily proposals for improbable business from self-styled Central Africa ministers… therefore we do not really trust in that. However in 1999 Nitin Desai, Under-Secretary-General for Economic and Social Affairs of the United Nations, on occasion of the launch of the International Year of Older Persons, asserted: “Longevity is a success. It is something that human beings desired since year zero! The fact that we are achieving it would not be considered a problem. It should be considered conquest.” We add that, since year zero on, open to change and project-oriented, visionary attitude always turned out to be effective strategies in difficult situations.